Quinicridone Gold becomes my focus color today. 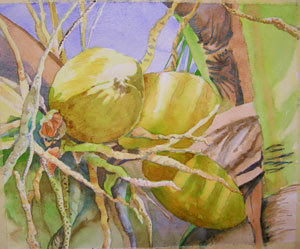 I have used it to glaze a gold wash over the coconuts and several other areas of the painting. This wash doesn't have to be terribly strong, but I still saved some of the white areas on the coconuts to show where the sun was hitting directly on the object. It never ceases to amaze me how valuable one light glaze of a certain color can illuminate a painting! The sun here in Florida is really strong and it casts deep, dark shadows. The contrasts of warm, bright, sunlit areas against cool, blue, soft shadows are really striking. Quinicridone Gold is one of my favorite colors for producing this effect. Here I have also used Prussian Blue, carefully to develop a few of the deep impressions on the trunk and here and there within the shadows. Prussian is a very intense, staining color, so use it with caution! A little goes a long way!